Data users should note that oxygen saturation values in the range of 100-120% were recorded in the near-surface water for the majority of casts on this cruise. The following information contains extracts from the JC086 cruise report. 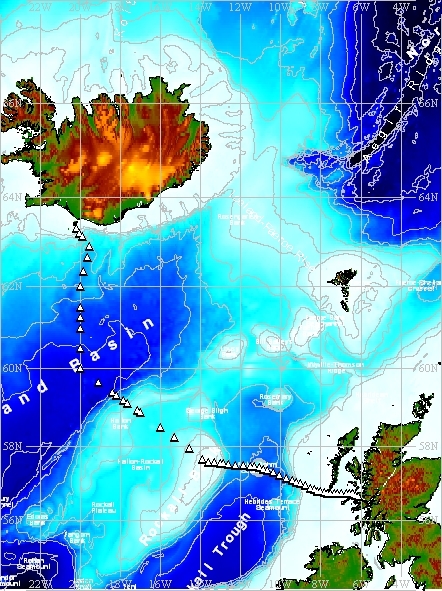 A total of 81 CTD casts were performed during the cruise which sailed from and back to Govan on the west coast of Scotland, incorporating the Extended Ellett Line and Wyville Thomson Ridge area. All casts deployed during the cruise were housed in a stainless steel frame equipped with dual temperature and conductivity sensors. The CTD sensors were located within and near the bottom of the rosette frame which held 24 10-litre Niskin water sampling bottles. Raw CTD data were transferred from the Sea-Bird deck unit to a LINUX machine via Sea-Bird software. The binary files are converted using Sea-Bird processing software. Physical units were calculated from the frequency data using the manufacturer's calibration routines and the data converted to ASCII format. The ASCII files were converted to MSTAR format and MEXEC programs run to process the data which included reducing the frequency of the data from 24Hz to 1Hz, calibrating the data, and averaging the downcast to a 2db pressure grid. A calibration was produced by merging the salinity sample data with the CTD data. Details of the MEXEC programs used and further details of the processing performed can be found in Griffiths et al. (2013). Throughout the cruise the CTD was sampled for salinity measurements in order to calibrate the conductivity sensors. Salinity was measured using a Guildline Autosal 8400B (#60839) in a temperature controlled room with the bath temperature set at 21°C and the ambient temperature set at approximately 20°C. All CTD data used for calibration purposes is sourced from the bottle files created by the Sea-Bird software. The autosal was standardised at the start of every run and a standard seawater analysed at the end of every crate. Each crate contained 24 bottles. The primary and secondary conductivity sensors were treated separately, where the bottle salinity data was used to calculate the bottle conductivity. This was then compared with the CTD conductivity for calibration purposes. Both sensors portrayed a change in calibration over time, with an apparent drift around CTD casts 16-19. There was, however, a 3 day break between cast 16 and cast 17 which is the likely cause of this change, so the stations were placed into 2 groups for conductivity calibration purposes (casts 1-16 and casts 17-81). The secondary sensor has been specified as the preferred data stream for this dataset, where the mean of all salinity residuals for this sensor was 0.0109, and the standard deviation 0.0671. Excluding outliers (defined as +/- 1 standard deviation from the mean), the mean of salinity residuals is 0.0004 and the standard deviation 0.0049. Bottle oxygen values were used to calibrate the CTD oxygen sensor. Firstly, the relationship between the bottle oxygen and the CTD oxygen was examined. Bottle sample units were converted to umol/kg using the calibrated CTD salinity. Oxygen was sampled by both the National Oceanography Centre (NOC) and the Scottish Association for Marine Science (SAMS) chemists, but was initially examined separately as part of inter-group comparison during the cruise. The 2 groups samples taken from different niskin bottles from the same casts, were often, but not always, fired at the same depths. The NOC group sampled more bottles than the SAMS group. Although there was a small offset between the NOC and SAMS oxygen samples, it was very difficult to determine which possessed higher accuracy, and so for the calibration of the CTD oxygen sensor all available oxygen bottle samples were used. After calibrations had been applied the mean of all oxygen residuals was 0.2 +/- 7.8 umol/kg, and when excluding outliers the mean was 1.0 +/- 5.1 umol/kg. It was decided that the secondary sensor was the preferred data stream for all parameters measured throughout the JC086 cruise. Griffiths C. R. et al., (2013). RRS James Cook Cruise JC086, 06 May 2013 - 26 May 2013. Govan to Govan, Scotland - the Extended Ellett Line. Scottish Association for Marine Science. (Scottish Marine Institute, Oban). Data arrived at BODC in a total of 81 MSTAR files representing the CTD casts conducted during cruise JC086. The data contained in the files are the downcast data averaged to a 2db pressure grid including temperature, salinity and dissolved oxygen channels processed to WOCE standards alongside concurrent fluorometer, transmissometer and turbidity data. temp °C Temperature of the water column by CTD (secondary sensor) TEMPST02 °C The secondary sensor is the preferred data stream. temp2 °C Temperature of the water column by CTD (secondary sensor) - - Not transferred. temp and temp2 contain the same data values so only temp was transferred. cond mS/cm Electrical conductivity of the water column by CTD (secondary sensor) CNDCST02 S/m /10. Calibrated by Originator with discrete salinity samples from CTD bottles. The secondary sensor is the preferred data stream. cond2 mS/cm Electrical conductivity of the water column by CTD (secondary sensor) - - Not transferred. cond and cond2 contain the same data values so only cond was transferred. psal - Practical salinity of the water column by CTD (secondary sensor) PSALST02 - Calculated by Originator using calibrated conductivity. The secondary sensor is the preferred data stream. psal1 - Practical salinity of the water column by CTD (primary sensor) PSALST01 - Calculated by Originator using calibrated conductivity. psal2 - Practical salinity of the water column by CTD (seconday sensor) - - Not transferred. psal and psal2 contain the same data values so only psal was transferred. oxygen µmol/kg Concentration of oxygen per unit volume of the water column DOXYZZ01 µmol/l Calibrated by Originator using discrete water samples from CTD bottles. Unit conversion automatically applied during transfer. fluor ug/l Concentration of chlorophyll-a per unit volume of the water column CPHLPR01 mg/m3 No unit conversion required as ug/l is the same as mg/m3. altimeter m Height above bed from CTD - - Not transferred. time s Time in seconds since the origin defined in the metadata field data_time_origin - - Not transferred. potemp °C Potential temperature of the water column (secondary sensor) - - Not transferred. potemp1 °C Potential temperature of the water column (primary sensor) - - Not transferred. potemp2 °C Potential temperature of the water column (secondary sensor) - - Not transferred. press_temp °C Temperature of the pressure sensor - - Not transferred.